We specialize in events, regardless of the size, from product launches, gala events, fundraisers, exhibitions, conferences, high profile events & opening parties, weddings and a wide range of private social events. 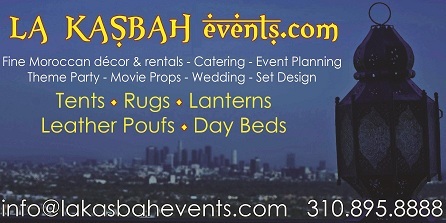 -Kasbah style, daybeds & pillows. -Mood light lanterns & chandeliers. From Tapas/appetizers to buffet or sit down dinners, We offer a wide choice of a fusion or traditional Moroccan cuisine.